Hiring good management for your green industry business is imperative to the success of your company. If you have a set of achievable and reasonable guidelines in place it will make the hiring process much more organized and you will know exactly what your company needs in an executive role. 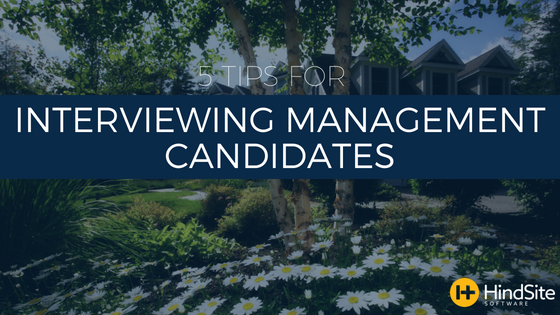 Here are five tips to remember when interviewing management candidates in your green industry business. A new CFO does not need to necessarily understand the ins and outs of the green industry business, but he or she should, of course, know the ins and outs of finance and accounting. They don't have to know everything, nobody does, but they need to be quick learners and capable of growing and changing to fit the needs and the mold of your company. Assess the personality of your current team and hire someone whose personality fits within that team. Being able to envision how someone fits into the daily occurrences of your business is important in the hiring process. Depending on the vibe of your team, whether it be fun and hardworking, laid back but responsible, whatever it may be, make sure that this person is the same way. If they aren't, make sure that they are capable of bending a little for the sake of the business. Don't be afraid of hiring someone whose skill sets obviously outshine your own. This is a good thing and will challenge you, and the rest of your staff, to be better and to work harder. Having a profitable business is more important than your ego. Even if it does take a little bruising at first, you'll get over it. Are the passionate about knowledge? Do they enjoy being a sponge and soaking up new things every day? Do they come to work with the expectation of growing even more than they did the day before? Are they excited when they speak? Only you can be the best assessor. You know the value and the model and the standard of your business. Make sure the candidates you are considering embody that. You most certainly CAN teach an old dog new tricks but the dog must be willing to learn. If he or she isn't willing to learn, then it's like that they might not be a good fit. The green industry business may seem simple, but in order to keep up it's important that the executive team is capable of growth and change, just like the industry is. Find out about the past events to reveal their skills and abilities. Even if their past jobs have nothing to do with the green industry business, their employment history and how they reacted in past experiences still says a lot about how they will work for your company.